Diabetes is a chronic condition characterized by high blood sugar, insulin resistance, and a relative lack of insulin. Type 2 diabetes (T2D) is the most prevalent form of diabetes mellitus. Type 2 diabetes is treated with lifestyle modifications, oral medications, and insulin. Around 90% of people with diabetes have type 2 diabetes. WHO predicts that T2D will be the seventh leading cause of death by 2030. Global Type 2 diabetes market is estimated to reach USD 64 billion by 2026. An ever-increasing prevalence of diabetes and increased usage of anti-diabetic drugs with non-glycemic benefits will drive the market. Also, the rich pipeline of novel agents is expected to get launched. However, the availability of inexpensive generics will hamper market growth. Global Type 2 diabetes market report segments the market by drug class, distribution channel and by region. Based on part treatment type, the market is segmented into Biguanides, Sulfonylureas, Alpha-glucosidase inhibitors, Thiazolidinediones, Glucagon-like peptide-1 receptor agonists, Dipeptidyl peptidase four inhibitors, Sodium-glucose cotransporter two inhibitors, and Insulin. Geographically, the market is segmented into five major regions, namely North America, South America, Europe, Asia Pacific, and RoW. North America is the largest market for Type 2 diabetes owing to the high market penetration of insulin and other antidiabetic drugs. The region was the most mature market in 2017 accounting for over 45% of the market. 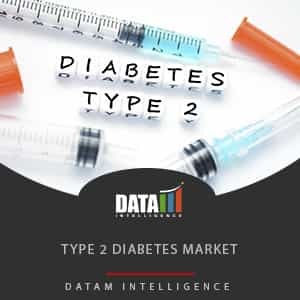 The report also profiles the following companies of type 2 diabetes market – Novo Nordisk, Merck & Co. Inc., Pfizer, Astra Zeneca, Bristol-Myers Squibb, Eli Lilly, Takeda, Johnson & Johnson, Sanofi, and others. Visualize the composition of Type 2 diabetes market across each indication, regarding type and treatment options, highlighting the critical commercial assets and players. Identify commercial opportunities in the Type 2 diabetes market by analyzing trends and co-development deals.